Justin Sullivan/Getty ImagesChains are struggling to hire enough workers, which could hurt their level of customer service. Chains like McDonald’s and Taco Bell are struggling to fill positions and retain workers, with 898,000 jobs open in the accommodation and food-services industry in August. “I don’t see this problem getting easier,” Panera Bread’s CEO Blaine Hurst told Business Insider during a recent interview. Restaurant industry investors and executives’ fears about difficulties hiring and retaining workers are mounting. There were 898,000 open jobs in the accommodation and food-services industry in August, according to a monthly report released by the Bureau of Labour Statistics on Tuesday. For comparison, that’s 146 million more positions open than in August 2017. Panera is addressing the “war for talent” by revamping its recruitment and training systems. Other chains, such as Jack in the Box and Dunkin’ Doughnuts, are investing in automation to cut down on the number of necessary workers.Retailers like Target, JCPenney, and Kohl’s are raising wages and adding benefits to deal with similar issues. One of companies’ biggest fears is that customer satisfaction will decline or operations will completely fall apart as locations struggle to fill positions. Domino’s executives faced questions in a call with investors on Tuesday whether customer service had been hurt by staffing struggles. According to the company, Domino’s hasn’t seen a decline in customer satisfaction, but workers are so busy they’re having a hard time getting an “incremental pizza” in the oven on Friday and Saturday evenings. “For some brands, it’s actually capping their sales potential,” John Hamburger, the founder of industry trade publication Franchise Times Corp., said to Business Insider in September. According to Hamburger, companies with low employee satisfaction rates and negative customer satisfaction scores will have the hardest time hiring and retaining workers. 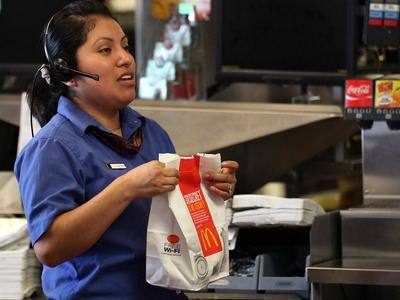 According to the The American Customer Satisfaction Index, the chains with the lowest customer satisfaction scores include McDonald’s, Taco Bell, and Jack in the Box. Correction: An earlier version of this story stated that there were 898 million open jobs in the accommodation and food-services industry in August.